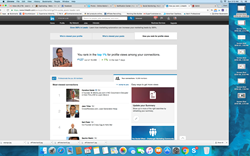 Digital marketing and online advertising expert and agency founder Evan Weber has exceeded 16,000 LinkedIn connections, a major social networking milestone. LinkedIn is full of gems. I find great opportunities all the time when I'm on their site. You get out of it what you put into it, truly. Evan Weber, Founder and CEO of digital marketing agency Experience Advertising, Inc. and conference circuit speaker on Internet marketing and advertising topics, has exceeded 16,000 professional connections on LinkedIn. LinkedIn is the world’s largest business-oriented social network. Experience Advertising is a digital marketing agency that implements and manages Internet advertising campaigns, digital marketing strategies, and social media marketing programs for corporations of all sizes. Evan has been in the e-commerce industry since 1997 with the launch of his first online auction website and began actively using LinkedIn shortly after they launched in 2003. Founded in 2003, http://LinkedIn.com connects the world’s professionals to make them more productive and successful. With more than 400 million members worldwide, including executives from every Fortune 500 company, LinkedIn is the world’s largest professional social network on the Internet. The company has a diversified business model with revenue coming from Talent Solutions, Marketing Solutions and Premium Subscriptions products. Headquartered in Silicon Valley, LinkedIn has offices across the globe. LinkedIn was sold to Microsoft in 2016 for 26 billion dollars. For more information about Experience Advertising, visit: http://www.experienceadvertising.com.